This velvety, fresh soup is my passive-aggressive way of clinging steadfastly to summer (yes, I realize it’s October). Fresh basil and peas are a perfect combination, simultaneously perking one another up, while nutty Parmesan gives a depth of flavor that makes you remember this soup. This soup also inspired me to add a new category that has been requested by several of my readers: low-carb. While I’m the last person you’ll find advocating a strictly low-carb diet, I do know that limiting starchy, refined carbohydrates has its benefits. This recipe has about 8 net carbs per serving. 2 tbsp grated Parmesan, plus more for garnish $4 for 12 oz. 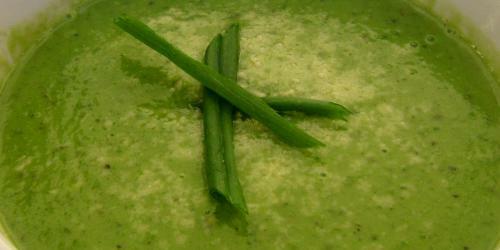 Combine green peas, stock, scallions, butter, basil and Parmesan in a soup pot over medium-high heat. Stir until the butter melts. Bring to a light boil and then reduce heat to medium. Allow to simmer for 10 minutes or until peas are soft. Remove from heat and puree using a food processor, blender or immersion blender. Season with salt and pepper to taste. If serving chilled, refrigerate for at least 2 hours or until cold. If serving hot, serve immediately, garnishing individual bowls with Parmesan and scallions. This soup was so creamy, light and flavorful! Not to mention, easy to make. I highly recommend it! so delicious! i made this soup for my husband and me and served it with whole wheat biscuits. it was mild and mouthwatering at the same time! i added a sprinkle of cayenne with the scallion garnish which added a perfect zing to each bite. thanks B.A.G! thank you for sharing this recipe with us. I will try this at home. Access technological support group experts who can answer all your QuickBooks questions.